After a few weeks of having to refrain from weaving, I am thankful that there was warp to weave one more rug. The quality of warp thread matters because it is the core of the rug. Never underestimate the value of good, strong warp thread for weaving rag rugs. First hem is going around the cloth beam. Weaving is almost complete! I like to use 12/6 cotton from Bockens. 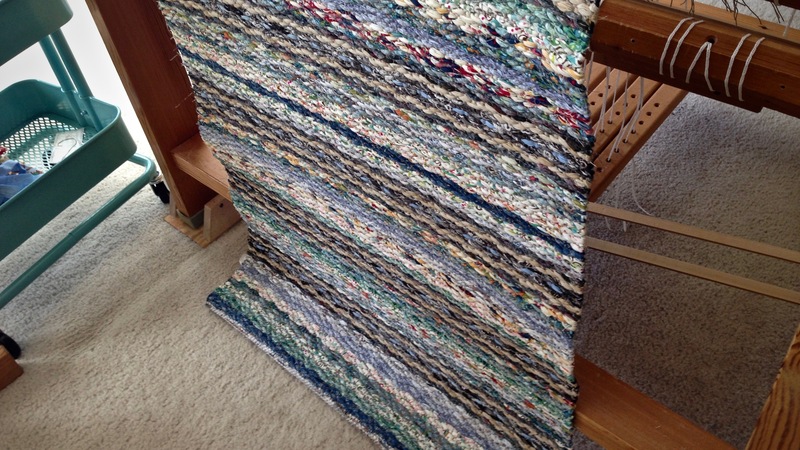 This rug warp is a six-strand thread with high twist. The smooth, nearly-unbreakable thread enables me to ratchet up the tension on the warp. That high tension helps produce sturdy, tightly packed rugs with tidy selvedges. Knowing you are making a rug that will last is a very satisfying and enjoyable weaving experience. Cutting off never gets old. Ta da! Hems are folded under for the picture. As soon as the hems are stitched, this rosepath rag rug will have its Etsy photoshoot. 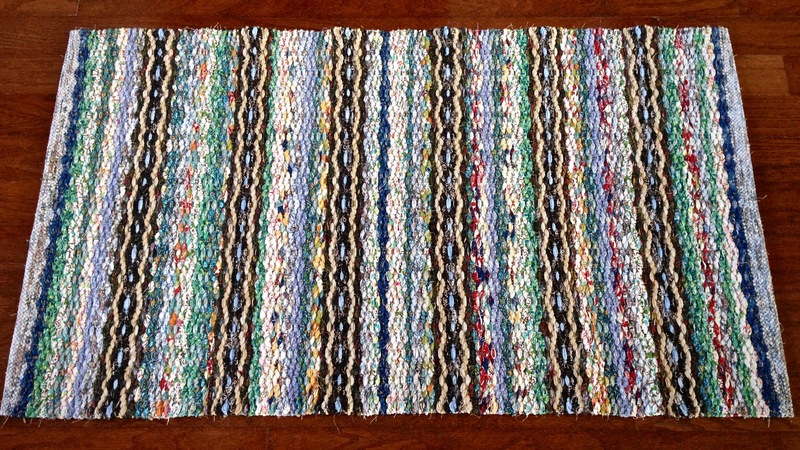 With finishing nearly complete, this rag rug will be enjoyed on the floor of someone’s home. Most people aren’t aware of the structural elements of a rag rug, but they do notice quality in the finished work. People, too, have an inner core–the heart. The heart matters. The strength of our inward framework determines our outward attitudes and actions. Since true quality is found in a life that serves others, most everything comes down to a matter of the heart. May your quality of life be noticeable. It’s amazing how a bunch of leftovers can be combined into something so beautiful. I’m so glad you are back to weaving again. Beautiful rug! Have you tried linen rug warp or poly/cotton rug warp in your work. Both of them are supposed to last far longer than cotton. Love your article in Handwoven magazine – lovely. Hi Martha, That’s a good discussion point. I have used linen rug warp for a wool rug. It’s great for that; and I think it would work well for rag rugs, but it raises the expense considerably. I’m not sure I’d find buyers for that. I haven’t tried poly/cotton rug warp. Some of the comparisons may be against the popular 8/4 cotton rug warp, which will certainly have a shorter life. It would take a lot to wear out the 12/6 cotton in a rug. I’m glad you saw the Handwoven article! Thanks for the compliment. Wonderful to hear you are back at the loom! Take care of yourself so you can weave on and on and on…………. Thanks, D’Anne, I’ll be very careful. I want to regain my status as Miss Weave-a-Lot. I live in Calgary, Alberta. Our closest weaving supply shop just closed this past summer. 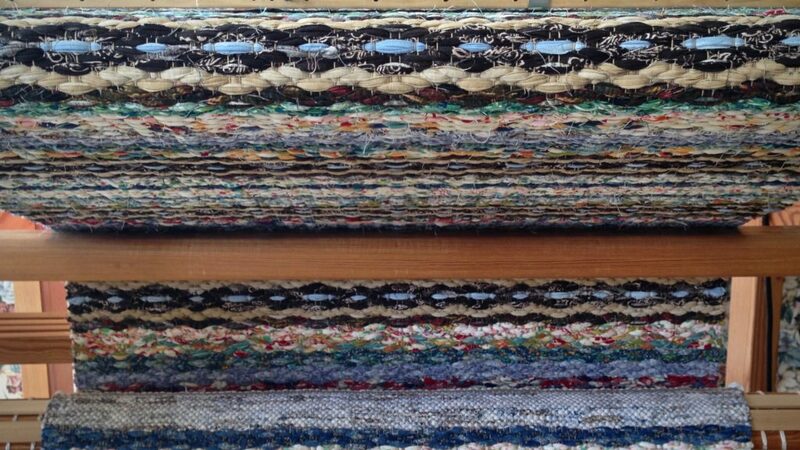 Where would you suggest the best place would be to order 12/6 rug warp cotton? Would like to buy Canadian..
Hi Sandra from Calgary, Welcome! I’m sorry, I am not familiar with Canadian sources. I usually purchase Bockens 12/6 cotton from GlimakraUSA.com or Vavstuga.com, both in the USA.